These are devices making it possible to make surface water safe to drink by filtering it through a porous material. There are centralised devices for pre-treating surface water or water from drilling with such filters but most ceramic filters today are manufactured for household use. This fact sheet concerns only this type of domestic filters with small capacities. According to the type, this entails small fixed facilities for household use or transportable devices making it possible to filter water wherever you are. This process, which has been used for several centuries now, is recommended by several humanitarian NGOs and is used in several countries in Africa and Asia. For example, the Initiative and Development association uses this method for making water safe to drink in several of its programmes, in particular in Benin, Togo and Haiti. Another use of this method concerns people who travel in countries where the water is not safe to drink. Several companies, such as KATADYN, offer transportable devices. 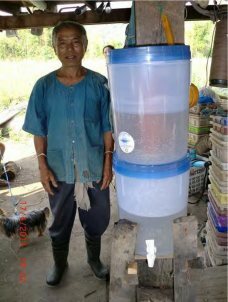 Simple and compact device intended for the production of drinking water for human consumption for a small community (household, store, restaurant, etc. ), this equipment performs particularly well and is robust and easy to maintain subject to training on the precautions for use. The populations concerned are all of those that, close to rivers or water points that are not clean, do not have access to drinking water or where there is a risk that the water that they are using is not, or is no longer, safe to drink. The filters can be used in the home, either with small autonomous installations, or more rarely be connected to the outlet of a water inlet or system for recovering rainwater. With regards to transportable systems, these are especially for populations that are not connected to a network, for nomads or hikers. Ceramic filters most often come in the form of filter cartridges in the shape of candles that are placed vertically in plastic containers of which the capacity can be up to 20 to 30 litres. 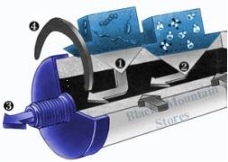 The water to be treated passes from the exterior to the interior of the cartridge and the treated water is collected in the lower portion (a more rudimentary device consists in positioning a simple membrane filter in a pot). 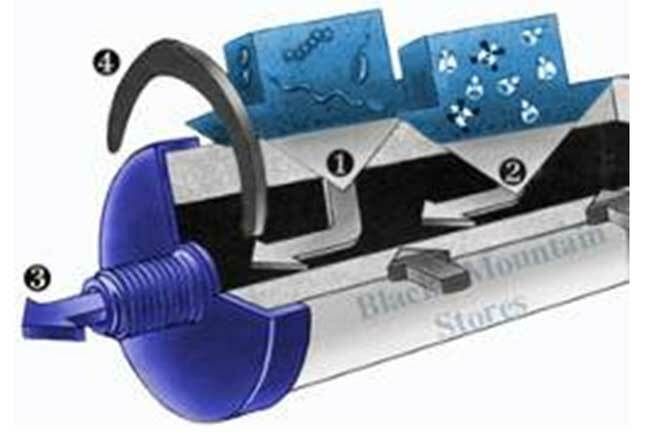 The filter element is soaked with fine colloidal silver particles used as a disinfectant and preventing the proliferation of bacteria in the filter. 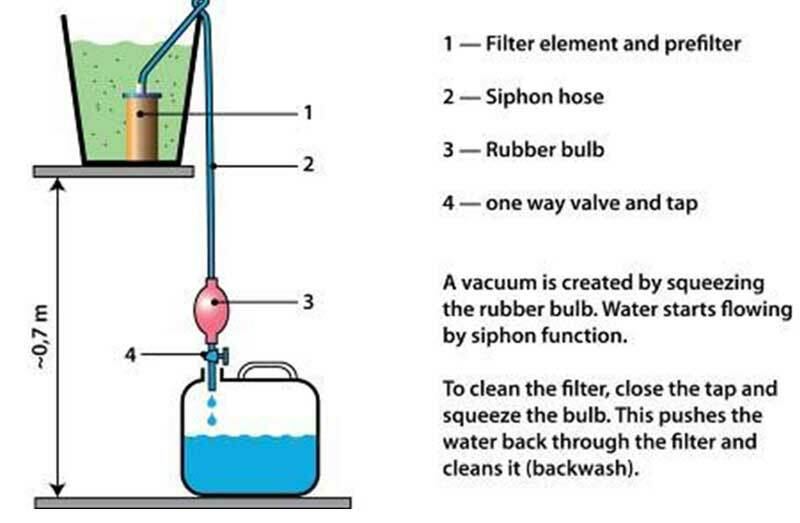 The use of a siphon as shown in the drawing hereinafter makes it possible to increase the production capacity and to wash the filter very easily through a backflow of the water treated. 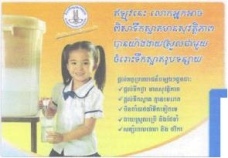 The method is based on microfiltration. The cut-off threshold varies from 0.1 to 0.2 microns which forms a barrier to retain all of the impurities in suspension as well as almost all of the bacteria and parasitic protozoa. The effectiveness against viruses has also been verified but cannot be guaranteed 100%. The system makes it possible to deliver clean water that is fit for human consumption. In case of turbidity in the water to be treated, ceramic membranes clog, which results in a decrease in the flow. It is therefore necessary in this case to clean the filter cartridges with a brush on a regular basis along with a slight disinfection with bleach. The latter do not become altered over time and so can be used for several years. Ceramic membranes do not become altered over time and as such offer a high level of safety for more than 20 years if they are washed on a regular basis. Maintenance that can be performed by the user. Eliminate almost all of the diseases present in stagnant water. Rudimentary devices can be manufactured locally in the developing countries. Mobile systems can be used by travellers. Can be used only on water that has relatively little turbidity in order to avoid clogging the filter too quickly. Risk of contaminating the water stored is it is not chlorinated a little. The price for complete cartridge systems producing 10 to 20 l/day is often around €200 to €250. Their service life is many years, but the cartridges have to be replaced on a regular basis, and they can cost €5 to €10. The cost for maintaining them is estimated at approximately 4 to 5 Euros /m3, and is therefore insignificant. Because of their reduced capacity and their high cost, they must be reserved for drinking water. More rudimentary systems can fortunately be manufactured at a lesser cost in developing countries but may have lesser capacities. As such in India, the TARA company markets silver ceramic filters called "Tara Swach" between €15 and €20. In Nicaragua, these filters are sold for about fifteen euros and in Bangladesh for less than 10 euros. 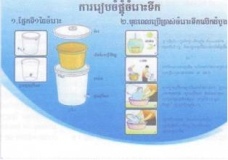 Training in Cambodia on the interest, instructions for use and maintenance of a ceramic filter. Using these filters correctly requires certain precautions concerning maintaining the cartridges and preserving the bacteriological quality of the water. 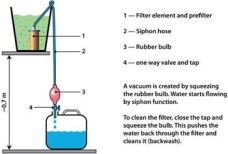 - National academy of sciences : Relatively short note in French :"Safe water is essential" specifying the main methods for filtering water, including that with a ceramic filter.